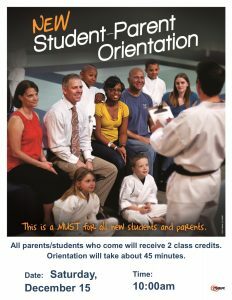 We will have an Orientation Meeting for new students and their families this Saturday, December 15, at 10:00am. Open to all new students — and especially recommended for Parents. We will go over the details of the Fundamentals and Tigers programs, including earning achievement stripes and belt rank advancement. You’ll also be able to ask any questions that you may have. We’ll also discuss the basics of how the Honors Program works, and how students qualify for membership. I encourage all our new students, parents and families to come if at all possible. Attendance will count for 2 Class Credits. Please register at the school, or contact us by phone or email if you plan to attend.